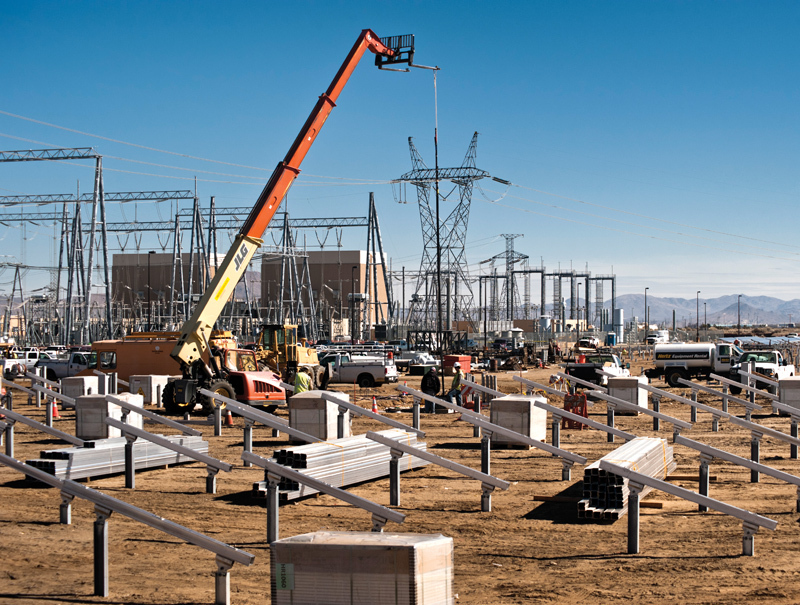 An 11.6 MW project in California's Mojave Desert is helping Los Angeles Water and Power move to more renewable power generation, and it also helped the municipal utility with training new employees. 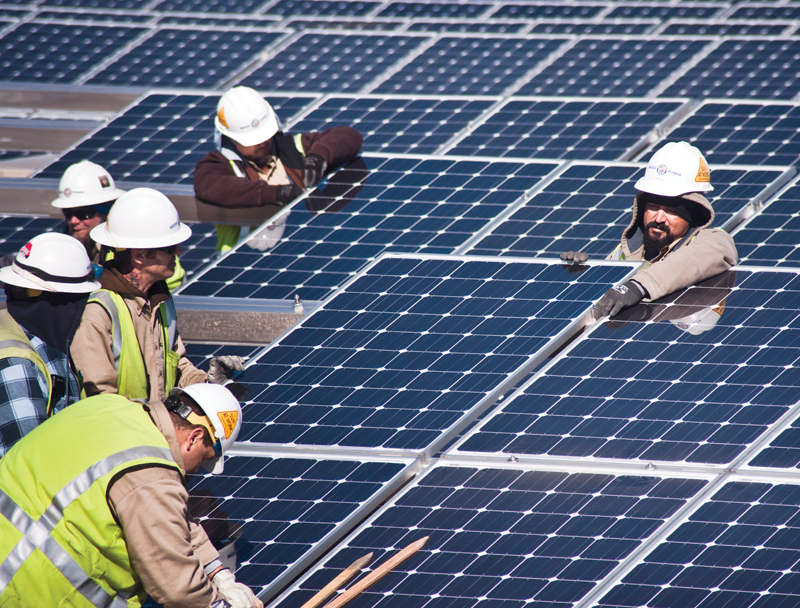 Working with SolarWorld, the project's designer and engineer, the Los Angeles Water and Power Department developed an innovative approach to address high employee turnover by using new hires to install an 11.6 megawatt solar project in Southern California's Mojave Desert. As a result, department officials were able to screen employees early about their interest in the outdoors before investing in expensive training. They also ended up with supervisors who were trained in solar installation and could instruct new hires and perform future maintenance. "It's a very, very unique program, and initially, it didn't make sense," said Raju Yenamandra, SolarWorld vice president of sales and business development in Camarillo, California. At first glance, he wondered if it wouldn't be more practical just to bring in a crew and install the solar project in one fell swoop. Once water department representatives explained their challenge of training and retaining new employees, SolarWorld representatives quickly saw the advantages. "This, I think, was a very creative move on their part, and it's perfectly OK for us because we would have hired people from outside anyway," Yenamandra said. SolarWorld became involved with the LAWPD—the nation's largest public utility—about four years ago after it put out a request for proposals for qualified vendors. Once a company is qualified, agrees to the terms and conditions, and signs the contract, it can quickly respond to department task orders during a three-year period. This allows the department to issue task orders for projects without going through individual and sometimes lengthy contract negotiations. "Because it's a city-owned utility, they don't want to go through contract review every time," Yenamandra said. "This is a smarter way of doing it." After a company responds to the task order, the board of commissioners approves the funding if it's a large enough amount. The solar installation is 65 miles north of Los Angeles on 42 acres of previously-unused land owned by the water and power department. The high desert location near Adelanto also meant good solar production potential, Yenamandra said. SolarWorld used its own proprietary Sunfix Ground Mount system, which requires no earth movement and a minimal amount of ground prep, on the LAWPD project. 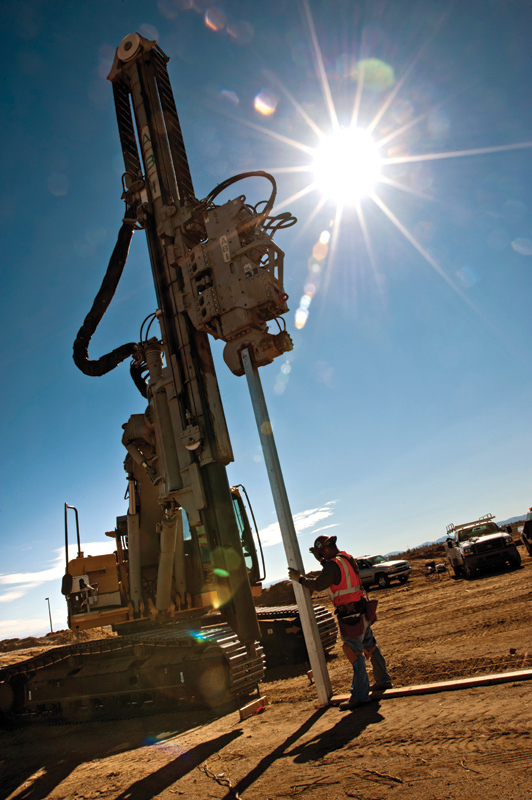 The 9,600 steel piers that support the racking systems were sunk into the ground at varying depths by a vibrating driver. The switching and converter station in Adelanto marks the southern terminus of the department's Intermountain HVDV transmission line, which links Southern California with wind farms and the Intermountain Power Project power generation facility in Utah. A connection point was right there, so no substation had to be built for the solar farm to hook into. "By taking advantage of existing assets, such as transmission systems and facilities that LAWPD already owns, we're able to realize cost savings and complete the Adelanto solar project faster than if we had built a new renewable power project elsewhere," Aram Benyamin, senior assistant general manager of the LAWPD power system, said in a news release. "This utility-scale project is part of a comprehensive solar strategy that involves roof-top and ground-mounted solar installed in [Los Angeles] that customers can benefit from through our Solar Incentive Program, a Feed-In-Tariff program that will launch this year, and a second 10-megawatt utility-scale solar project that will break ground this summer at Pine Tree Wind Farm in Mojave, California." The Los Angeles utility will own and maintain the system. The project was initially budgeted at $48 million, but the utility was able to obtain Qualified Energy Conservation Bonds offered through the American Recovery and Reinvestment Act, a U.S. government economic stimulus program. The bonds carry a subsidized interest rate, saving the utility's customers about $12 million, according to the utility's website. SolarWorld, which received the utility task order during the fourth quarter of 2010, designed and engineered the system and supplied the materials. Construction at the Adelanto Switching Station began in November 2011, and the solar facility was in service in early June. What proved to be an engineering challenge was designing the system so the water and power department could monitor and control it from remote computer terminals, Yenamandra said. "What the utility wanted was to have a supervisory control and data acquisition system," Yenamandra said. "That means whether it's 10 MW or 100 MW, the operators of the plant can remotely turn it off and on." The task involved coordinating with six or seven different entities, such as the control group, the monitoring group, power engineering group, substation design group, and the safety group, within the utility.. Careful planning and scheduling was needed to ensure enough materials were delivered to an adjacent laydown area to keep workers busy and avoid down time due to shortages. "You have all of these individual departments that come together to that one controlling station, and you have to coordinate all of your engineering activities with every group," he said. "Sometimes you end up being the coordinator within the group. That's where the complexity comes. "It's an engineering challenge, but it was a fun project. And our engineers had a great time because of the challenges, not only from the engineering part but also meeting the requirements of each group and making it into a single piece of hardware and software." Nearly all of the solar facility's components were sourced from U.S. suppliers, from the aluminum posts on which the racks were mounted to the 46,322 Sunmodule 250-watt mono solar panels from SolarWorld's Hillsboro, Oregon, manufacturing plant, and the 13 SMA America inverters manufactured in Denver, Colorado. "It makes economic sense, as well, as we are also big on the carbon footprint of what we do," Yenamandra said. "Economics and environmental—those are the two principals we care about. It's not just economics. Whenever we can possibly have environmental benefits, we follow through on that." For example, the solar panels were transported in containers by rail most of the way, then the containers were transferred to trucks for final delivery to the site. Careful planning and scheduling was needed to ensure enough materials were delivered to the adjacent laydown area to keep workers busy and avoid down time due to shortages. "The last thing we want is to have workers at the site waiting on materials," he said. SolarWorld used its own proprietary Sunfix Ground Mount system, which requires no earth movement and a minimal amount of ground prep, he said. The 9,600 steel piers that support the racking systems were sunk into the ground at varying depths by a vibrating driver. "Whether they are eight feet underground, or you drive them 8 ½ feet under ground, the tops of all of these panels will be at the same level, so you don't have to go cut and fill the land," Yenamandra said. "You're disturbing the land as little as possible." Panel installation was pretty straightforward, with 23 modules forming a string and 117 combiner boxes to combine the strings, he said. Altogether, about five million pounds of aluminum went into the Sunfix Ground Mount racking system. From there, 13 inverters convert the DC power into AC. But the power had to be synchronized with the utility's voltage, which required an additional transformer. That's where Cooper Power Systems came in. The Waukesha, Wisconsin-based firm supplied the 13 Envirotemp FR3 biodegradable and non-toxic dielectric fluid-filled transformers that stepped up the 360 volts from the inverters to 4,160 volts. Installation was done in large part by LAWPD employees. As one of the oldest municipal utilities in the nation, LAWPD has a large number of employees retiring and needs to fill those vacancies. In the past, the utility would bring in new recruits to undergo expensive classroom training, only to have many quit once they went to the field. "The attrition rate is very, very high because people don't like what they're seeing in the field, and you can't be sent to the field until you're trained," Yenamandra said. "They have no idea if they're going to stick around, so they always have a shortage of qualified employees." 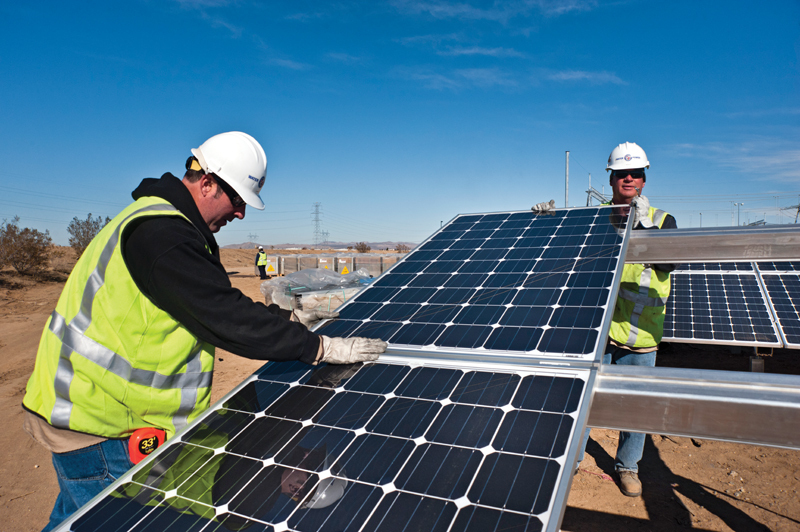 Nearly all of the solar facility's components were sourced from U.S. suppliers, from the aluminum posts on which the racks were mounted to the 46,322 Sunmodule 250-watt solar panels from SolarWorld's Hillsboro, Oregon, manufacturing plant, and the 13 SMA America inverters manufactured in Denver, Colorado. SolarWorld brought LAWPD supervisors to its facility in Camarillo for several days of extensive hands-on training on the correct way to install racking systems and solar arrays. The supervisors also saw the incorrect ways to do things and were given opportunities to troubleshoot and correct the errors. When the supervisors returned and began training employees, SolarWorld representatives were there initially to oversee it. "The advantage is now you have qualified people workwise who know electricity quite well and now know more about solar," Yenamandra said. "And they're comfortable giving direction to the new employees who are doing the actual installation." Whenever electricity was involved, a licensed electrician did the actual work. The innovative training program appears to be beneficial, he said. "Those people who stick around and like outdoor work, you can take and put through the training," Yenamandra said. "The utility is taking a long-term approach in solving a short-term problem of replacing the employees who are retiring through this job-skills program." The Adelanto plant will also help LAWPD meet state renewable energy standards. Currently, the utility obtains 44 percent of its power from coal-fired generation plants, 26 percent from natural gas-fired facilities, nine percent from nuclear, and seven percent from large hydroelectric, according to the utility's webpage. Under the California Renewable Portfolio Standard, investor-owned utilities, electric service providers, and community-choice aggregators must obtain 33 percent of total procurements from renewable energy sources by 2020.